Is It Time for AFRICOM to Get Its Own Troops? In another sign of the American military’s expanding operations in Africa, U.S. Africa Command is spending nearly $25 million to bring secure, nearly fiber-speed communications to its remote outposts across the continent. Last month, the command bought access to SES Government Solutions’ O3b constellation — a network of medium-earth-orbit satellites that use 2.5-meter satellite dishes to provide connectivity nearly as fast and robust as the Verizon Fios you might get in Washington, D.C. The multi-year award flew largely under the radar, as have other commands’ contracts for O3b satellite service. It doesn’t necessarily reveal a huge change in America’s operations on the continent, but it is a sign there’s a large demand for connectivity and data out in the field, said Alice Hunt-Friend, a former director for African affairs in the Pentagon’s policy shop. 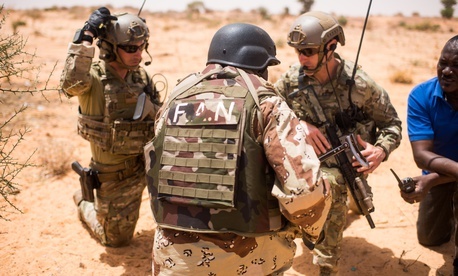 Pentagon officials have long pointed out the vast distances troops have to travel when working in Africa — the “tyranny of distance” was part of the reason it took long hours to come to the aid of special operators who were ambushed in Niger last year. It’s no small matter to move people around the various operating theaters, let alone connect them with permanent internet infrastructure. “From the top of Somalia down to the southernmost tip, that’s about the distance from Maine to southern Florida — and that’s just one single country,” Fazen said. And although AFRICOM is now laying internet cables where U.S. forces have long been deployed, that’s just a start. So the implications of the contract are huge. Now, at say, the remote drone base in Niger or locations even more isolated, troops will have a faster, better way to securely connect to networks, transfer files and communicate. “The latency — the amount of time it takes for the information to travel” via the O3b satellites “is now only about 150 milliseconds,” said Mike Blefko, vice president of business development at SES. That’s far less than the 500 milliseconds it takes for signals bouncing off satellites in geosynchronous orbit, and it makes a difference in a soldier’s experience. Add that to the service’s high throughput — file transfers take hours instead of days — and it begins to enable a more connected fighting effort on the continent, wherever AFRICOM decides to put in the comparatively small ground equipment.